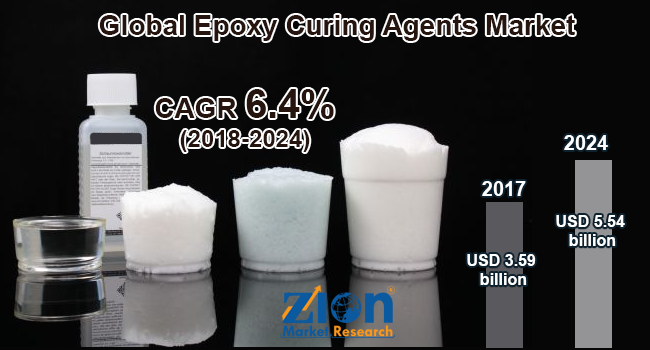 Zion Market Research has published a new report titled “Epoxy Curing Agents Market by Type (Amines, Imidazoles, Polyamides, Anhydrides, Polyamidoamines, and Others) and by Applications (Coatings, Construction, Electrical & Electronics, Wind Energy, Composites, Adhesives and Other Applications) - Global Industry Perspective, Comprehensive Analysis and Forecast, 2017 – 2024”. According to the report, global epoxy curing agents market was valued at USD 3.59 billion in 2017, is expected to reach USD 5.54 billion in 2024 and is anticipated to grow at a CAGR of 6.4% between 2018 and 2024. Epoxy curing agents due to its superior properties like mechanical strength, chemical strength, and electrical insulation are widely used in several end-user industries. Additionally, epoxy curing agents are also used to manufacture printed circuit boards (PCBs) for the various kinds of electronic products like mobile devices, smartphones, automotive electronics, and others. In refineries, epoxy curing agents are used as corrosion inhibitors, thus, increased demand for epoxy curing agents in the refinery industry is likely to enhance the epoxy curing agents market. The global epoxy curing agents market is anticipated to witness substantial growth in the future due to increasing coatings and construction industries. Moreover, the growing demand for curing agents in coatings industry across the world is having a prominent influence on the global market for epoxy curing agents. The construction industry is anticipated to drive the epoxy curing agents market growth in upcoming years. However, environmental concerns may impact positively or negatively on the epoxy curing agents market growth in the forecast period. Nevertheless, the growing adoption of epoxy curing agents for wind energy application is expected to propel the demand for epoxy curing agents market in the next few years. The global epoxy curing agents market can be classified on the basis of type, application, and regions. On the basis of type, the global epoxy curing agents market is segregated into amines, imidazoles, polyamides, anhydrides, polyamidoamines, and others. Amines are widely used in a variety of applications such as adhesives, coatings, composites, and electrical & electronics. On the basis of applications, the market is segmented into coatings, construction, electrical & electronics, wind energy, composites, adhesives, and others. Coating industry is the most dominating application and is expected to witness significant growth in the near future. In 2017, Asia Pacific accounted for the largest market share for the global epoxy curing agents market. The Asia Pacific is the fastest growing market for epoxy curing agents and is estimated to continue its dominance in the forecast years. The countries such as India, China, and Japan amongst other countries are becoming the largest consuming nations of epoxy curing agents for construction, coatings and electrical & electronics applications. Europe is expected to be the second leading regional market in terms of revenue and volume as well. The prosperous growth of the coatings industry is the major driving factor for the growth of the epoxy curing agents market within the region. Further, the Middle East & Africa is projected to hold immense potential for epoxy curing agents market and is expected to grow moderately owing to the increasing demand for epoxy curing agents for adhesive applications. Moreover, Latin America is expected to show decent growth in the forecast period due to the increase in industrial applications. The epoxy curing agents market consists of a large number of players and is highly fragmented. Companies operating in this market include Evonik Industries, Cardolite Corporation, Dow Chemical Company, DIC Corporation, BASF SE, Hexicon Inc., Incorez Ltd., Gabriel Performance Products, Momentive Speciality Chemicals, Brenteg Specialities Inc., Aditya Birla Chemicals, and Mitsubishi Chemicals, among others.